Solar cells are devices which convert solar energy into electricity, either directly via the photovoltaic effect, or indirectly by first converting the solar energy to heat or chemical energy. The most common form of solar cells are based on the photovoltaic (PV) effect in which light falling on a two layer semi-conductor device produces a photovoltage or potential difference between the layers. This voltage is capable of driving a current through an external circuit and thereby producing useful work. Although practical solar cells have only been available since the mid 1950s, scientific investigation of the photovoltaic effect started in 1839, when the French scientist, Henri Becquerel discovered that an electric current could be produced by shining a light onto certain chemical solutions. The effect was first observed in a solid material (in this case the metal selenium) in 1877. This material was used for many years for light meters, which only required very small amounts of power. A deeper understanding of the scientific principles, provided by Einstein in 1905 and Schottky in 1930, was required before efficient solar cells could be made. A silicon solar cell which converted 6% of sunlight falling onto it into electricity was developed by Chapin, Pearson and Fuller in 1954, and this kind of cell was used in specialised applications such as orbiting space satellites from 1958. Today's commercially available silicon solar cells have light-to-electricity conversion efficiencies exceeding 15%, at a fraction of the price of thirty years ago. There are now a variety of methods for the practical production of silicon solar cells, such as amorphous, single crystal, polycrystalline, thin film, ribbon, sliver, etc. Solar cells can also be manufactured using many different materials (copper indium diselenide, cadmium telluride, gallium arsenide, etc). Commonly, PV cells are made using either single crystal wafers, polycrystalline wafers or thin films of silicon. 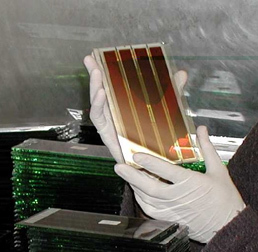 Figure 2 Different types of silicon solar cells. Single crystal wafers are sliced (approx. 1/3 to 1/2 of a millimetre thick) from a large single crystal ingot, grown at around 1400°C. The silicon must be of a very high purity and have a near perfect crystal structure (see Figure 2 (a)). Polycrystalline wafers are made by a casting process in which molten silicon is poured into a mould and allowed to set. Then it is sliced into wafers (see Figure 2 (b)). As polycrystalline wafers are made by casting they are significantly cheaper to produce, but are not as efficient as monocrystalline cells. The lower efficiency is due to imperfections in the crystal structure resulting from the casting process. Almost half the silicon is lost as sawdust in the two processes mentioned above. Amorphous silicon, one of the thin film technologies, is made by depositing silicon onto a glass backing substrate from a reactive gas such as silane (SiH4) (see Figure 2 (c)). Amorphous silicon is one of a number of thin film technologies. 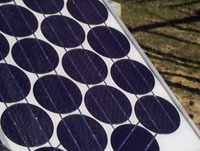 This type of solar cell can be applied as a film to low cost substrates such as glass or plastic. The silicon is called “amorphous” because it has a non-crystalline structure that is similar to glass found in windows and bottles etc..
A silicon atom has 4 relatively weakly bound (valence) electrons, which bond to adjacent atoms. 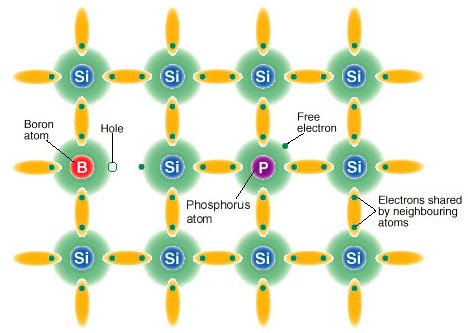 Replacing a silicon atom with a dopant atom that has either 3 or 5 valence electrons will therefore produce either a space with no electron (a hole) or one spare electron that can move more freely than the others. This is the basis of how doping can be used to control the conductivity of materials. P-type doping, the creation of excess holes, is achieved by the incorporation into the silicon of atoms with 3 valence electrons, most often boron or aluminium. The “p” in p-type doping refers to what can be imagined as creating a positive “hole” in the valence band in Band Theory, which can move about under the influence of an electric potential. N-type doping, or the construction of extra electrons is achieved by incorporating an atom with 5 valence electrons, most often phosphorus. The “n” in n-type doping refers to the excess of negatively charged electrons to provide a constant supply of electrons that passes through the circuit in a PV system. (see Figures 3 and 4). Figure 3 Silicon Crystal Lattice with Dopant Atoms. Once a p-n junction is created, electrical contacts are made to the front and the back of the cell by evaporating or screen-printing metal onto the wafer. The rear of the wafer can be completely covered by metal, but the front only has a grid pattern or thin lines of metal, otherwise the metal would block out the sun from the silicon and there would not be any output from the incident photons of light. To understand the operation of a PV cell, we need to consider both the nature of the material and the nature of sunlight. 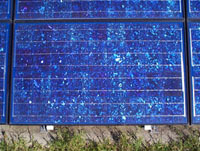 Solar cells consist of two types of material, often the p-type and n-type silicon. Light of certain wavelengths are able to ionise the atoms in the silicon (causing atoms to either gain or lose electrons) and the internal field produced by the junction separates some of the positive charges ("holes") from the negative charges (electrons) within the photovoltaic device. The holes are swept into the positive or p-layer and the electrons are swept into the negative or n-layer. Although these opposite charges are attracted to each other, most of them can only recombine by passing through an external circuit outside the material because of the internal potential energy barrier. Therefore if a circuit is made (see Figure 4), power can be produced from the cells under light because the free electrons pass through the load to recombine with the positive holes. 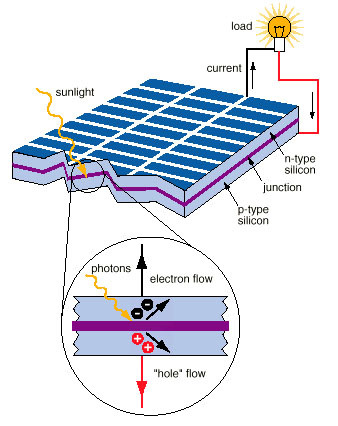 Figure 4 The Photovoltaic Effect in a Solar Cell. For example, single crystal silicon solar cells cannot currently convert more than 25% of the solar energy into electricity, because the radiation in the infrared region of the electromagnetic spectrum does not have enough energy to separate the positive and negative charges in the material. However PV cells made of multi-junction gallium arsenide and other similar alloys have achieved efficiencies as high as 31%. Polycrystalline silicon solar cells have an efficiency of just over 20% at present and amorphous silicon cells, are currently about 10% efficient, due to higher internal energy losses than single crystal silicon. Other thin film cells besides amorphous silicon such as cadmium telluride and copper indium diselenide have achieved research efficiencies of 16% and almost 18% respectively, and the records are often being rewritten. It should be noted that commercially available PV cells conversion efficiencies are lower than the above percentages. 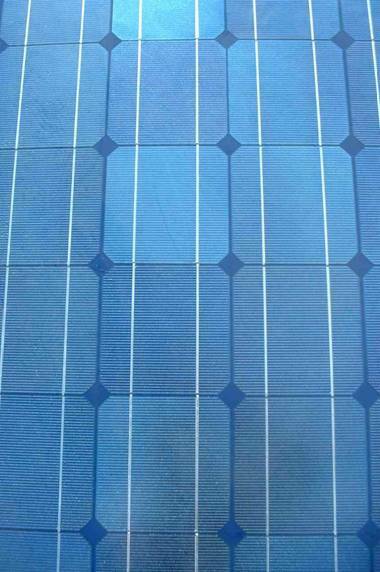 A typical single crystal silicon PV cell of 100 cm2 will produce about 1.5 watts of power at 0.5 volts DC and 3 amps under full summer sunlight, of which the approximation of 1000Wm-2 is used (Wm-2 are the symbols that represent the Watts of energy for every square metre). The power output of the cell is almost directly proportional to the intensity of the sunlight. For example, if the intensity of the sunlight is halved the power will also be halved (see Figure 5). 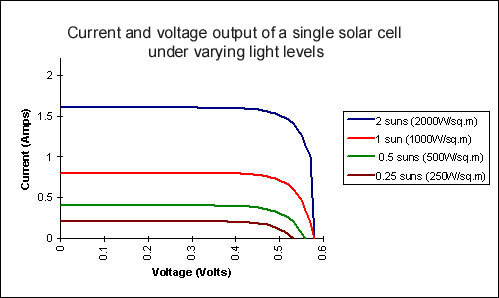 Figure 5 Graph showing current and voltage output of a solar cell at different light intensities. An important feature of PV cells is that the voltage of the cell does not depend on its size, and remains fairly constant with changing light intensity. However, the current in a device is almost directly proportional to light intensity and size. This means that when people want to compare different sized cells, they record the current density, or amps per square centimetre of cell area. The power output of a solar cell can be increased quite effectively by using a tracking mechanism to keep the PV device directly facing the sun, or by concentrating the sunlight using lenses or mirrors. However, there are limits to this process, due to the complexity and cost of the mechanisms, and the need to cool the cells. The current output is relatively stable at higher temperatures, but the voltage is reduced, leading to a drop in power output as the cell temperature is increased. More information on PV concentrators can be found later in this Portal file. 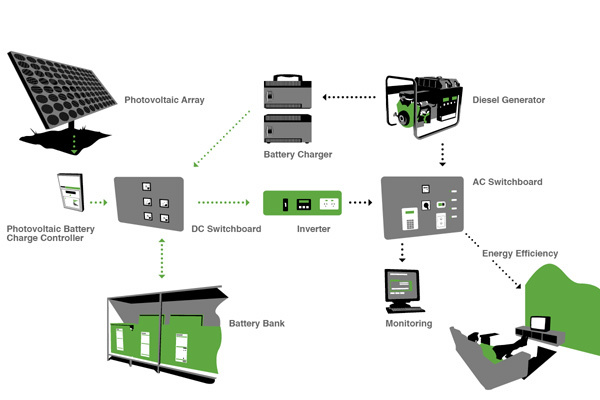 Figure 6 Elements of a PV System. (4) an inverter, for converting the direct current to alternating current (eg. 240 Volts AC – like most Australian homes). (5) backup power supplies such as diesel generators (this is optional). AS 2676 Guide to installation, maintenance … of secondary batteries in buildings. Figure 7 Tracked PV Array containing 16 panels. Trackers are used to keep PV panels directly facing the sun, thereby increasing the output from the panels. Trackers can nearly double the output of an array (see Figure 8). 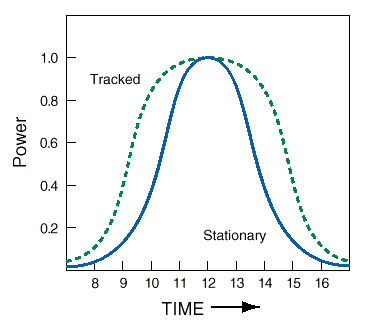 Careful analysis is required to determine whether the increased cost and mechanical complexity of using a tracker is cost effective in particular circumstances. A variety of trackers, which will take about 10 panels, are manufactured in Australia. Figure 8 Power output for tracked and a stationary array. The daily energy output from PV panels will vary depending on the orientation, location, daily weather and season. On average, in summer, a panel will produce about five times its rated power output in watt hours per day, and in winter about two times that amount. For example, in summer a 50 watt panel will produce an average of 250 watt-hours of energy, and in winter about 100 watt-hours. These figures are indicative only, and professional assistance should be sought for more precise calculations. Arrays generally run the panels in series & parallel with each other, so that the output voltage is limited to between 12 and 50 volts, with higher amperages (the amperage are the units used to measure current). This is due to safety issues and to minimise power losses. Energy storage is often necessary when power is required when the sun is not shining - either at night or in cloudy periods - or in quantities greater than can be supplied directly from the array. Specially designed "deep-cycle" lead acid batteries are generally used. Unlike normal batteries, they can discharge about half of their stored energy several thousand times before they deteriorate. Each battery is usually 2V, and the total battery bank usually has many batteries in series and parallel to give the required power rating. Battery banks need to be individually sized to suit the particular applications, depending on total daily solar radiation, total load, peak load and the number of days storage required. Generally, battery storage costs about $250 per kWh of energy stored for domestic sized systems. Inverters transform low voltage DC power (eg 12V, 24V, 32V or 48V from batteries) into high voltage AC (generally 240 V in Australia). Inverters are necessary if mains-voltage appliances are to be used. In assessing the cost of the total system, it may be more economical to purchase an inverter and mass-produced consumer appliances than to use low voltage DC appliances, which may be more expensive than normal appliances. Some appliances, such as high efficiency light globes are not presently available for low voltages. In this case, the cost of more panels must be balanced against the cost of an inverter. As a rule of thumb, inverters cost about $1 - $2 per watt of output, depending on size and features. For example a 1.2 kW sine wave inverter with energy management features costs approximately $2500. The major production costs of inverters are derived from the design, development, raw material, and product assembly factors of production. There are several Australian companies that manufacture inverters for the local and export market and currently local research is being conducted that focuses on substantially reducing the cost of large inverters. Backup or auxiliary power supplies are required when complete reliability of electricity supply must be guaranteed, when it is uneconomical to provide battery storage for infrequent extended cloudy periods, or when some appliances have large and intermittent power requirements that cannot be met economically from the PV system. For further information on batteries, inverters and other enabling technologies, see the SEE Technology Information Portal. Sometimes wind generators are used in conjunction with PV systems if the combination of sun and wind is viable. Small petrol or diesel generators are often used as the backup supply of power. These petrol or diesel generators are relatively cheap to purchase (less than $1000 per kW) but expensive to run. Several Australian companies are developing total hybrid supply systems that optimise the use of each component to the specific conditions of the application. In 2007 PV modules cost around $4 per peak Watt, depending on the PV technology used. Ten years ago, this module would cost between $5 and 7 per peak Watt. In 1997 PV systems cost between $9 – 14 per peak Watt, depending on the components used in the system and the country. In 2007 prices for PV systems between countries were converging towards the price of $6 - 7 per peak Watt (Figure 9) (Watt, M., 2008). Figure 9 Price of PV modules and systems (constant USD/W). (Courtesy of the IEA Photovoltaic Power Systems Programme). 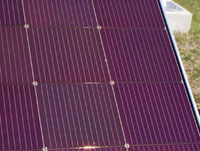 BP Solar has the only module manufacturing plant in Australia in Sydney. BP Solar produce cells from imported wafers, of which 75% are exported. BP Solar export 52% of the modules they manufacture. BP Solar’s Sydney Olympic Park facility is the largest manufacturing centre in the southern hemisphere and employs around 300 people. The facility has a maximum annual cell production capacity of 50MW, and a module production capacity of 10MW per year which operates continuously around the clock to supply the market (BP Solar, 2006). 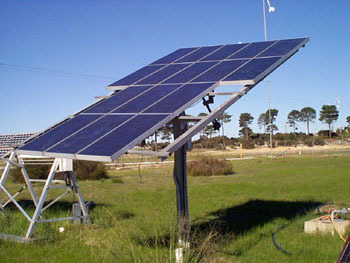 Solar Systems currently manufacture concentrator PV systems using imported cells, but is in the process of establishing a manufacturing plant domestically (Watt, M., 2008). Origin's US$15M plant in Adelaide will be the latest edition to Australia’s manufacturing capacity when pilot manufacturing expands into full production up to 5 MW annually (Watt, M., 2008).. There are other smaller manufacturers such as Dyesol and CGCsolar. For a list of Australian manufacturers, wholesalers, consultants, associations and sales companies click here. Figure 10 Dyesol’s 3rd Gen PV is technology based on artificial photosynthesis (Courtesy of Dyesol). The total international production in 1997 was 130 MW worth more than $500 million. In 2004 the consolidated world total production of PV cells increased to 1146 MW in 2004 or around. $7 billion (see Figure 11). In 2004 the top five manufacturers of PV cells were; Sharp, Kyocera, Shell Solar, BP Solar, and RWE Schott Solar which accounted for 60 percent of the market. The total production for IEA reporting countries in 2007 was above 2700 MW. Figure 11 Production and production capacity of PV modules (MW) in IEA reporting countries. (Courtesy of the IEA Photovoltaic Power Systems Programme). In Australia and the USA, the emergence of green power schemes, which permit customers to choose renewable energy options, has added considerable impetus to the growth of the industry. Several grid-connected solar farms have been constructed including one at Kalbarri in WA, Singleton, the Western Plains Zoo, the Sydney Olympic Village in NSW, Wilpena Pound in SA, and the King's Canyon National Park in NT. On the world stage, Australia is only a small player with an estimated current installed capacity of around 82 MW. The world total installed capacity is estimated to be above 8000 MW. Figure 12 Cumulative installed PV capacity between 1992 to 2007 in IEA PVPS reporting countries (Source: IEA Photovoltaic Power Systems Programme). The rate of growth of the PV installed capacity is around 40%, with Germany and Spain installing the vast majority of this capacity. The rate of growth in grid-connected systems were enhanced by the new subsidies while off-grid system growth remained lower, but still in positive territory (Figure 13) . Figure 12 Cumulative installed PV capacity and % annual increase between 1992 to 2007 in IEA PVPS reporting countries (Source: IEA Photovoltaic Power Systems Programme). The largest single PV installation (60MW) was built in 2008 in Olmedilla, Cuenca, Spain. For a list of the world's current top 50 largest photovoltaic power plants click here. Figure 13 shows the installed PV capacity for each IEA PVPS reporting country over a 16 year period. Figure 13 Cumulative installed PV (MW) in IEA PVPS reporting countries over time. (Source: IEA Photovoltaic Power Systems Programme). In addition to constructed PV capacity, there is much generating capacity proposed and under construction for new solar power plants. In the US the Stirling Energy Systems (SES) and Southern California Edison (SCE) have unveiled plans for the construction of an expansive 4,500-acre 500 MW solar generating station in Southern California. For more information on concentrating solar technologies see the SEE Information Technology Portal. The international market for photovoltaic cells is presently growing at around 40% per year, and the cost of panels is declining continuously in real terms due to both new technologies and mass production. There are confident predictions from leading PV manufacturers in USA, Japan and Europe that the price of PV power will be increasingly competitive with fossil fuel generation over time. These predictions generally refer to power at the panel, and do not take into account the various other system costs mentioned above. Photovoltaics Special Research Centre, University of NSW. High efficiency polycrystalline cells, where the polycrystalline material is cheaper than single crystal silicon. In Australia both UNSW and ANU have research programs in this area. School of Photovoltaic and Renewable Energy Engineering, Australian National University. UNSW has an area of thin film device research and ANU, with their commercial partners Origin Energy, have developed the new Sliver® technology that uses 90% less silicon than current solar PV modules at competitive cell and module efficiencies (see Figure 14). In 2007 the Sliver® panels received IEC certification, while in 2008 the Origin Energy entered the manufacturing phase of its Sliver® technology at the Regency Park facility in South Australia (Origin Energy, 2008). Figure 14 A transparent Sliver® module for architectural cladding (picture courtesy of ANU). Dyesol’s technology is based on Dye Solar Cell (DSC), which has been identified in forecasts including the Japanese and EU Photovoltaic Roadmaps as an emerging new solar technology (see Figure 14). Dyesol’s 3rd Generation PV is based on artificial photosynthesis and is manufactured with low-priced raw materials without producing toxic emissions and has the potential for rapid efficiency enhancement. New processes, in particular DSC, are leapfrog technologies with the potential to revolutionise the industry and drive down production costs. The DSC tiles are ochre coloured, with introduction shortly of other colours such as grey, green and blue. The tiles can be connected in series or parallel to produce panels for building integration as exposed mounts and replace the existing building facade (Dyesol, 2008). 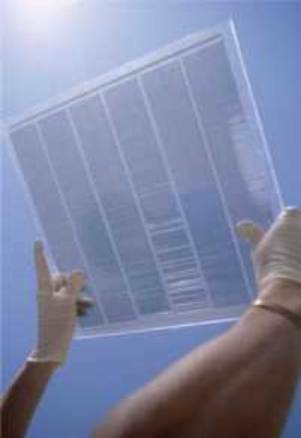 The crystalline nature of the silicon film ensures that it will last for decades even when exposed daily to harsh sunlight. Several scientific papers have been published that describe the Crystalline Silicon on Glass (CSG) technology in detail. These are currently available from CSG Solar's website. CSG Solar AG, based in Thalheim near Bitterfeld (Sachsen-Anhalt), has a 24-hour run 13 MWp manufacturing capacity is preparing to expand manufacturing of the PV modules using its patented CSG technology. This technology is the result of a ten-year research and development effort by an international team based in Sydney, Australia, under the leadership of world renowned experts in the field of crystalline solar cell technology. The CSG technology allows the production of PV modules using less than 1.5 µm thick crystalline silicon on a textured sheet of glass (CSG Solar AG, 2008). Solar Sailor Holdings Ltd (SSHL) is an Australian unlisted Public Company founded in 1999 with over 150 shareholders. In 2004 SSHL founded a 49% owned US subsidiary in Virginia USA, UOV LLC for the sole purpose of commercialising unmanned ocean vehicles using the SS 'hybrid marine power' and 'solar wing' technology. The subsidiary signed a contract with the US Navy for the development of unmanned ocean vehicles over the next 18 months. The Chairman of SSHL is Hon Mr Bob Hawke, ex Prime Minister of Australia and the CEO is Dr Robert Dane, founder and ex NSW Green Ambassador. SSPL owns several patents in hybrid and solar wing technology. The Sydney Solar Sailor Ferry has been used as a test platform for component technologies and has attracted over $1.5M in grants and sponsorship, as well as winning a string of environment, design, innovation and product acceptability awards. It has been operating commercially and profitably since 2000 in a tough market. (Solar Sailor, 2008). Information regarding renewable energy resources, technologies, applications, systems designs and case studies. Koltun, M.M. Solar Cells, Their Optics and Metrology. Allerton Press Inc. 1988. Markvart, Tomas (ed), Solar Electricity, John Wiley & Sons Ltd, Chichester, 1995. BP Solar Webpage “An Introduction to Alternative Energy” (Online) http://www.bp.com/productlanding.do?categoryId=7041&contentId=7046652 (Accessed 10 November 2008). CSG Solar AG Webpage “CSG Solar AG signs Supply Agreement with IBC SOLAR AG and Blitzstrom GmbH” (Online) http://www.csgsolar.com/pages/medias_ne.php?lang=en (Accessed 10 November 2008 - no longer available). Dyesol, 2008. Webpage “Technology” (Online) http://www.dyesol.com/index.php?page=Technology (Accessed 10 November 2008). Photovoltaic Insider’s Report - Vol. X No. 2 February 1991, Vol. XIV No. 4 April 1995, Vol XVII No. 2 February 1998. Solar Sailor, 2005. Homepage (Online) http://www.solarsailor.com (Accessed 10 November 2008). Watt, M. 2008. National survey report of PV power applications, Australia. http://www.iea-pvps.org (Accessed 10 November 2008).